You cannot put life on hold to have a moment of grief, so every second, half the people in the world are split in two. This is what they mean by life goes on, and the worst is that you go on along with it too. Have you ever been delayed in an airport without a book and no way of getting one? I have. Luckily, when my flight in San Francisco had a 5-hour delay, I remembered passing a bookstore in the terminal earlier, and immediately headed over. Compass Books not only had a bookstore in the terminal, it had a FANTASTIC bookstore. Old books, brand new releases, and everything in between. I spent a good 30 minutes browsing and trying not to buy everything. 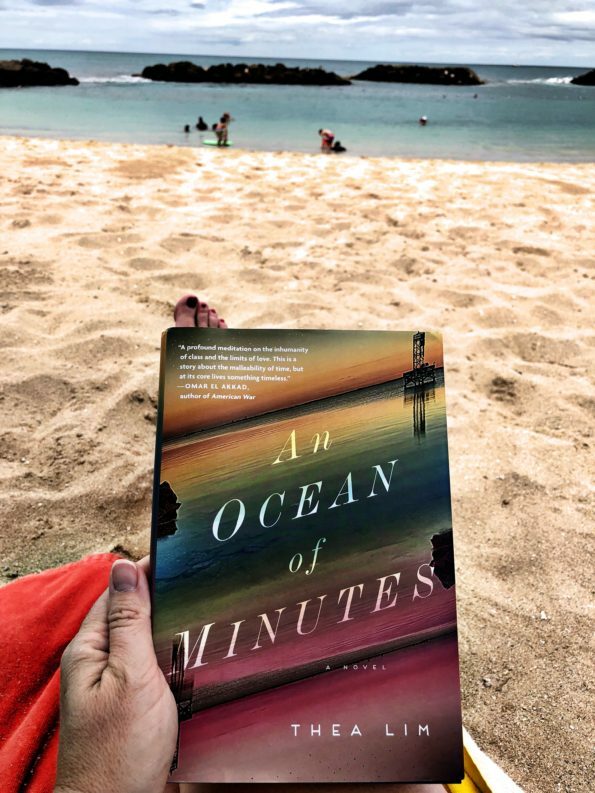 One of the books I settled on was An Ocean of Minutes by Thea Lim. It was one I hadn’t heard of, and when I saw it compared to Station Eleven, one of my favorite books, I had to give it a try. This story is about Frank and Polly, a couple in the middle of a flu epidemic in America. Time travel has been invented in the future, and when Frank catches the flu, Polly decides to time travel to the future in order to secure health insurance for Frank and to meet him in the future after the epidemic has passed. They agree on a time and place to meet in Galveston, 12 years in the future, and she heads off. However, Polly is sent an additional 5 years into the future with no way of going back, no money, and no way of finding Frank. She has to navigate her new life in a new America and try to find Frank, if he’s even still waiting for her. I thought this was a really interesting story and plot (I love post-apocalyptic settings), and I definitely understand why it’s compared to Station Eleven. Lim’s writing is beautiful, almost poetic (just look at that beautiful quote above), and she put a bit of a twist on the flu epidemic story. However, I didn’t love it as much as I expected. Some of the chapters seemed to start in the middle of a story, and I had to flip back to remind myself of what was going on. And while I truly appreciate what the author was trying to do, a lot of spots in the book felt like she was trying to do too much. It felt like Lim was trying to write higher brow literary fiction, and instead she might have embraced just writing a fun, well-written time travel book with a great story. It felt a bit too cerebral in parts, and I just wanted to be on the adventure with Polly. That being said, while I didn’t love this book, I did think it was well-written, and Lim clearly has a lot of talent. I think this is a good book that just happened to not be for me. If you enjoy post-apocalyptic books that really take a good look at humanity and how people respond in catastrophic situations, definitely give An Ocean of Minutes a try and let me know what you think of it. I want to find what else the author has written and give that a try as well!